The Spinc of No Return | Where's my backpack? 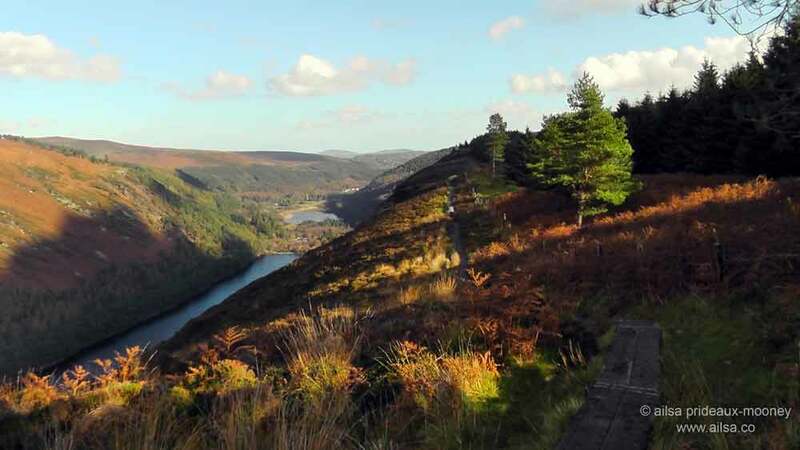 Glendalough is a gem in the heart of the Ireland’s Wicklow Mountains. The name is Irish for “Valley of the Two Lakes” and the area is teaming with monastic ruins and abandoned mining villages. Most of these sites are accessible via short, easygoing trails, but to appreciate the true splendour of the location, you have to work a little harder. The Spinc is one of the best trails to get you up to a height where you can admire the glacial landscape in all its glory. “An Spinc” is the Irish for ‘pointed hill’ and the trail is appropriately steep. 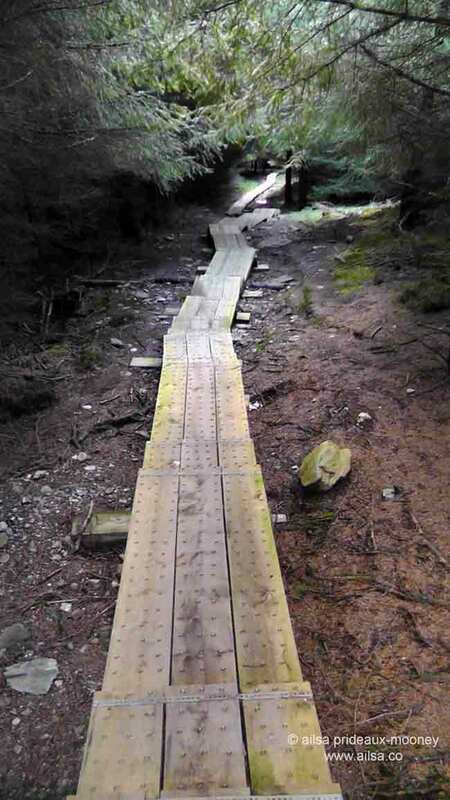 It is one of the more popular trails, so in 2002, in an attempt to protect delicate bog lands from being trampled to oblivion by avid hikers, the Irish Army constructed an impressive boardwalk out of studded railroad ties. Now, instead of scrambling up a muddy slope, you ascend a zigzagging wooden staircase with about 600 steps. I had psyched myself up for the 600 steps but was undecided as to whether or not it would be wise to count the steps as I went. I couldn’t figure out whether it would be a good thing or a bad thing to know how many more steps I still had to go as I struggled up the hill. The trail didn’t waste any time at all getting serious. 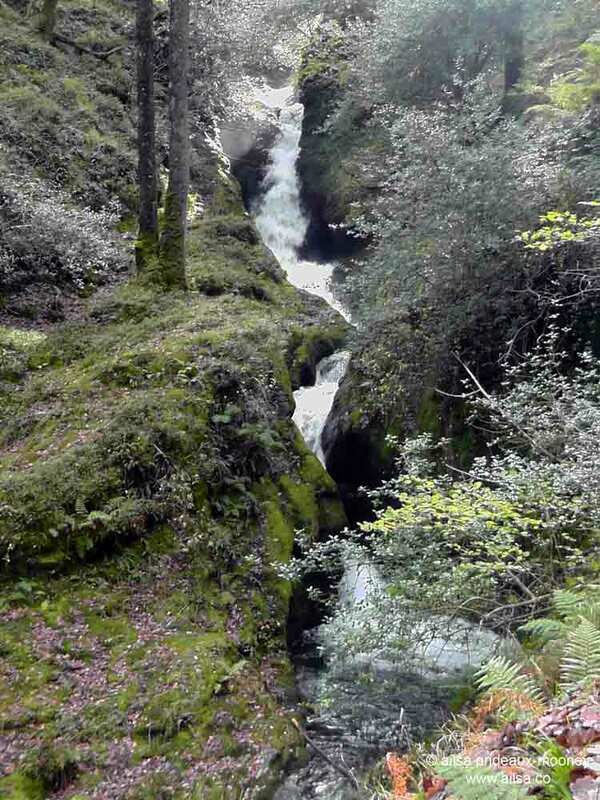 2 minutes into the trail I was clambering up steep steps alongside Poulanass Waterfall – Poulanass is Irish for “Hole of the Waterfall” and true to its name, there were several plunge pools carved into the rocks below by the force of the water. Distracted by the spectacle of the falls, I forgot to count the steps, and mentioned it to my friend as we traipsed along. “Oh, these steps aren’t part of the trail”, he explained, “that comes later.” I gulped inwardly, trying to calm my inner wussy hiker. I can hike for miles on end if the trail is moderately flat, but substantial elevation gain takes away my will to live. This wasn’t the steep part? Leaving the waterfall behind the trail veered off to the right through thickening forest and up ahead I spotted the start of the infamous steps. They didn’t look too bad, I told myself, starting up the steps with a bound. I actively deciding against counting which turned out to be the right decision. After two flights I was a hot mess, bright red in the face and bathed in perspiration. The only thing that kept me going was not knowing for sure how far along the trail I was. With each turn in the staircase, I imagined the peak of the mountain would be right around the next corner. If I had been counting, I would have known there were still 579 steps to go and I would probably have cried. 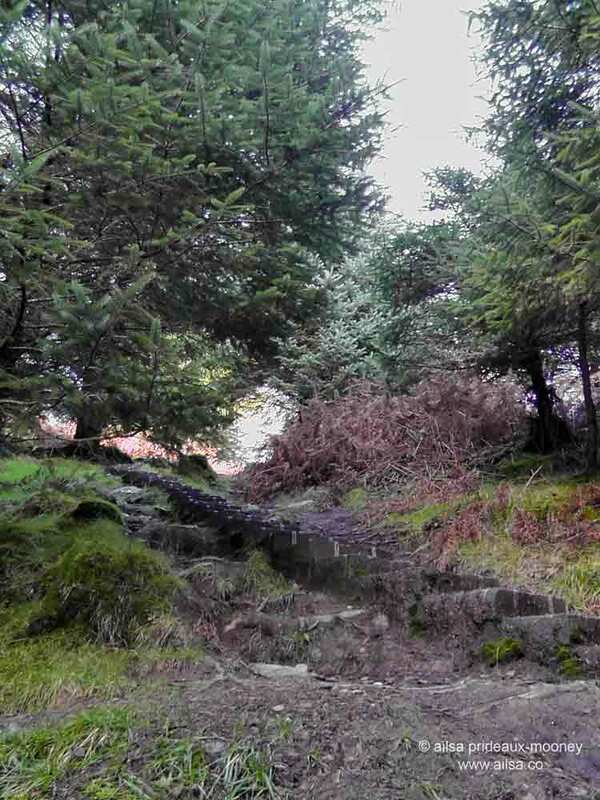 With a lot of patience on my friend’s behalf, and sheer doggedness from my side, we scaled the steps and somewhere along the way, with blood pounding in my ears, the forest thinned and then disappeared altogether. Tufts of heather and spikes of grass dotted the heath and just as we crested the hill, the sun came out and lit up the golds and browns of the dried ferns and sedges. The two lakes sparkled deep blue as we made our way along the boardwalk. I had to layer up again; the air was much cooler up here, and the trail had leveled out so my pulse returned to normal and my face stopped glowing. We stopped for lunch, homemade sandwiches gobbled hungrily as we sat gazing out across the lakes and the lush surroundings. Fortified, we continued onwards. 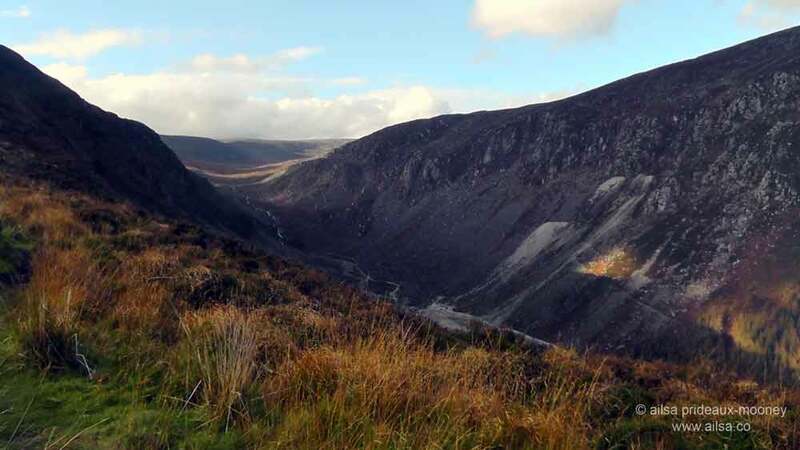 Up ahead, the most dramatic of sights greeted us, the staggering beauty of Glendalough’s glacial valley. This is the spectacular landscape you don’t get to appreciate from down below. The sight of that wondrous vista made every single one of those 600 steps worthwhile. This entry was posted in Europe, Ireland, Photography, Travel and tagged environment, humor, inspiration, nature, photography, photos, travel, writing. Bookmark the permalink. Lovely post. Had no idea what spinc meant. And have never seen this gorgeous scenery. Want to return to Ireland, for sure. Wow! Amazing place that you describe so well with narrative that takes us along and stunning photos. I can relate to your trepidation regarding hills – I retired after many years as a desk jockey in UK, totally fat and unfit. And joined the local trekking group for a lakeside amble, but the trail was submerged so they decided to go over the peaks instead of around. Gasping after a few hundred meters of moderate uphillness, I stopped to envy the 80-year olds bouncing along. The hill is called Besparmak which translates as Five Fingers. I added one of my own. Besparmak is the ancient volcanik mountainous region north of Bafa Lake near the southwestern Aegean coast of Turkey. It’s famous for prehistoric and early Christian cave paintings, a popular area for hermits, full of ruins from various cultures from the dawn of history to Byzantine and Ottoman. Now very popular as a base for trekking. 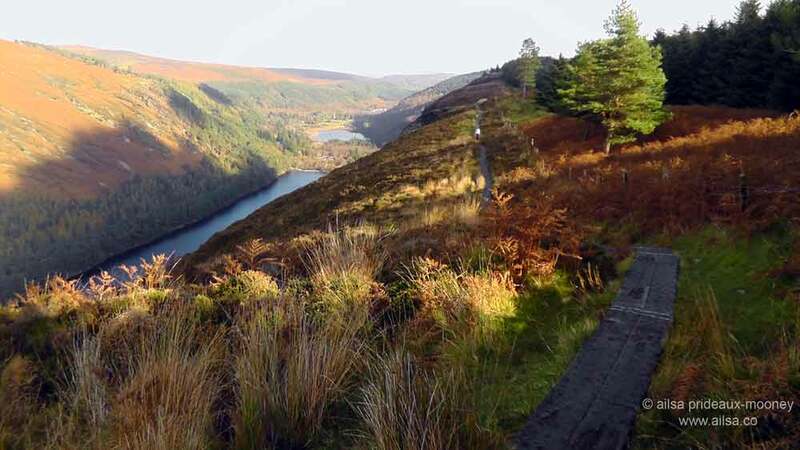 I feel your post does justice to Glendalough. Though I haven’t been there, your storytelling and photos are wonderfully magic.